Everyone here whispers, it is forbidden to speak loudly. We speak close the ear as do the sisters among us. You only can shout during recess. 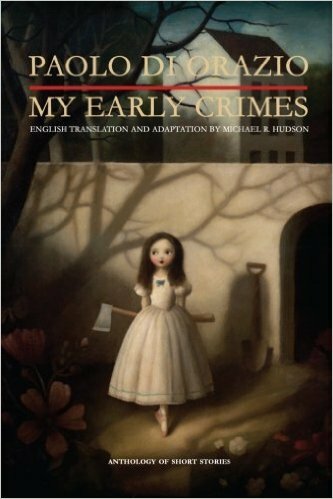 My Early Crimes is an anthology of 10 short stories. They are quite the collection of extremely dark macabre tales, designed to climb under the skin. Paulo Di Orazio is quite successful in creating a group of stories that will make many people uncomfortable while reading them. For the unaware, Orazio has built up quite a name for himself in Italy and this is his first translation of stories to hit the American market. As such I welcome you to a sample of several of the torture laden stories he has selected to share. Our Mother’s Eyes focuses on a grieving family with three children who were once encircled with a loving mother and father. Now grief and madness reigns since the passing of their Mother. As they come to gather and celebrate Mother’s Day with their father – who no longer makes any sense and has become an entirely different person since the passing of his wife. The children are subjected to his insanity and the haunting of their mother who sits out front of their home. Does danger loom for the children? We’ll say this, they survive their morbid new lifestyle, and they do so by any means necessary. Silence! is another horrific little piece where the deaf son of a famous tenor is anxious to share something with his father. This young man goes to unbelievable places to achieve the one all important goal of his life: hear his father’s beautiful voice. This is a twisted one that will amaze readers. Original Sins takes a spin on religion, centering on what is to be a short summer vacation at the “Colony” with Mother Zoara. She’s a woman who certainly shares no real love of Christ but rather has it flipped around to be quite the opposite. Life in The Colony is as close to Hell as one would could imagine. The young victims here are ready for a change. Each of these stories has a definite theme that runs throughout the collection…Children …they are the victims and the tormentors as well. I found it to be a bit disturbing but a very interesting change from what I normally come across. Much like other tales of victimization, where children are involved, things can prove to be disturbing. So this is me issuing a heads up for those who try to avoid such tales. My suggestion, go ahead and read this one. I think most will put aside the aspect of suffering children and be intrigued by the tales themselves. Thank you so much for your candid review Vitina! Greatly appreciated. I added this one to my wishlist. Violence towards children doesn’t bother me. Also I have wanted to read the author, but cannot speak Italian. Thanks. Love to hear your thoughts when you do Matt!